The Congressional Papers Section (CPS) met during the Society of American Archivists (SAA) annual conference in Washington, D.C. on August 15. 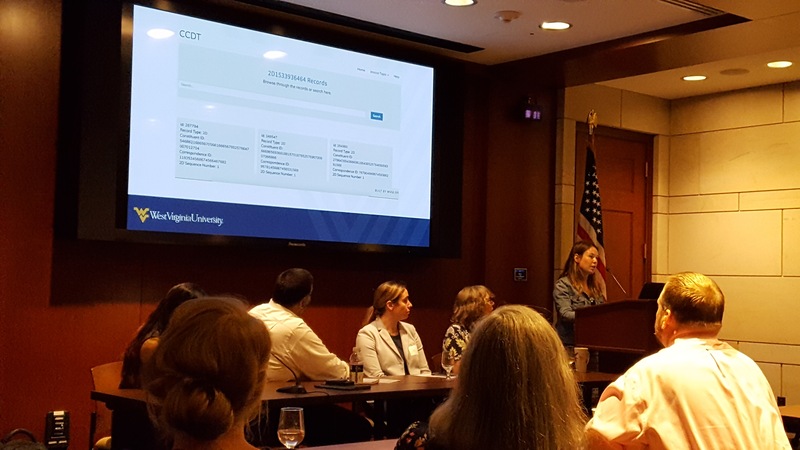 The venue in the nation’s capital provided session organizers a chance to bring in congressional staffers and gave the opportunity for archivists to visit with their congressional delegations. The most prominent theme of the day was “advocacy”—advocacy for the history of undocumented groups, advocacy for saving important data, and advocacy for congressional offices to keep and donate their records—and the various ways this can be achieved. The final panel, moderated by Nathan Gerth of the Advocacy Task Force, focused on the idea and practice of advocacy, on which CPS has a new brief “CPS Advocacy Day 2018”. The session featured “insider perspectives” from several Senate staffers from offices in various stages of archiving, along with the experiences of a repository archivist, Leigh McWhite of the University of Mississippi. It was an open and often frank discussion, which ranged from how we as archivists can advise offices better, getting the attention of the Member, useful communications strategies, why the word “archivist” still scares staffers(!) and what to do about it, to the challenges of finding the best and most suitable repository–even whether a repository will even want the collection. To the last issue, which McWhite joked was a “dirty secret,” there may be institutions which have internal collecting policies that place limitations on what they can take and that there may be bureaucratic barriers on their end that prevent more active outreach. Hopefully, attendees left motivated about new ways they can share and showcase their collections, work with legislators and their staffers, and why saving the CSS data (which can contain those communications and interactions with underrepresented groups!) may be worth it. The WVU CSS tool can be downloaded at https://github.com/wvulibraries/rockefeller-css. They have used Senate and House office data sets, one using the “Archival” download (limited number of fields) and the more robust “SDIFF” Interchange. More information about the tool can be found in the CSS Task Force report. Should be available on the CPS website. The Electronic Records Committee (ERC) of the Congressional Papers Section (CPS) started a blog series in 2016 entitled “Ask a Systems Administrator,” in which repository archivists working with congressional electronic records submit questions for systems administrators working in congressional offices. The goal with this project was to help congressional archivists better understand the congressional environment. 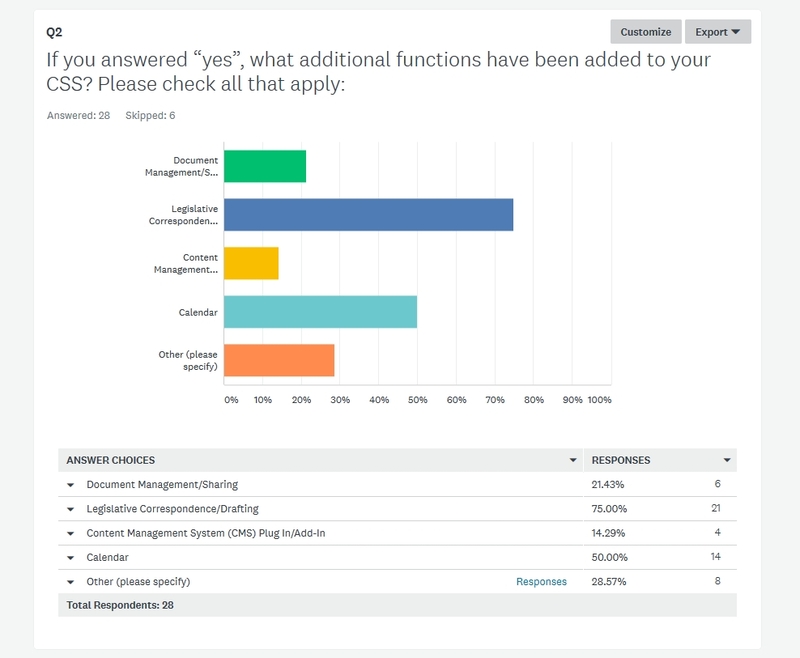 For the ERC’s session on preserving and accessing CSS data held during CPS Day 2018, Committee member Elisabeth Butler of the Senate Historical Office put together a simple survey of U.S. Senate systems administrators (SA) and correspondence managers on whether offices were using CSS for purposes beyond managing constituent correspondence and casework. Her colleague, Alison White, presented a quick summary of the survey results at the session. The survey provides a snapshot of how congressional offices are currently employing their CSS. The survey (built using the free version of Survey Monkey) was sent to the SA and correspondence manager listservs on July 23 and again on July 31. A total of 34 offices responded (answers were kept anonymous). Question 1: Is your office using CSS beyond basic constituency work? “I think we might use it for more things if the functionality was there…and if staff were more strongly compelled to use it”! 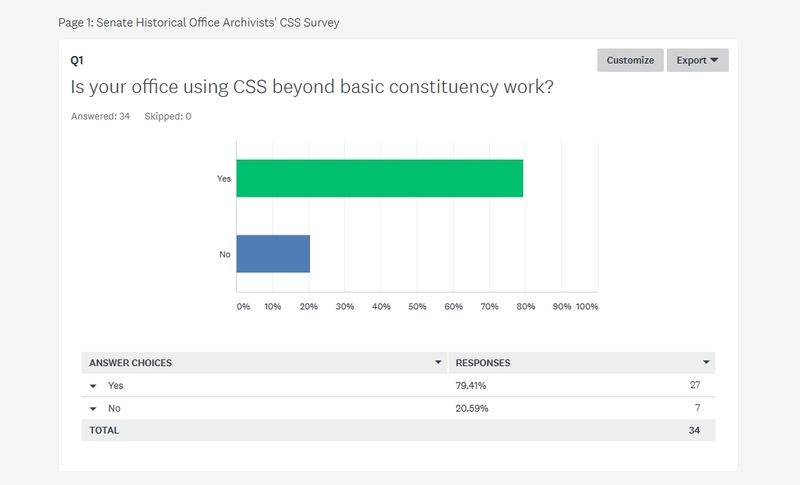 Question 4 was for those administrators who wanted to further discuss their offices’ use of CSS with the Senate Historical Office’s archivists. Vik Kulkarni, a Senate Systems Administrator, who was on the ERC session panel, backed up these responses. Vik, who has set up several personal offices’ IT systems, has found that staffers will often start using the CSS for document management because they find it better structured than the shared drives! They also find it a good way to keep “final” versions of documents organized and accessible. Want to know more about what Vik (and Lucy Shaw from the House side) said about the CSS? Check out the CPS Day 2018 recap. In 2016 the Task Force on Technical Approaches to Email Archives was formed to “construct a working agenda for the community” and articulate “a conceptual and technical framework” to archiving email. A Task Force feature of note is that, alongside members from academic libraries and institutional archives, there are representatives from two private sector tech companies, Microsoft and Google. Its final report “The Future of Email Archives,” is now out. The report’s “primary objective…is assessing and recommending methods by which archivists can engage with these new…technologies as well as identifying gaps and recommending additional development.” The report recognizes that, while most archives have a basic handle on capturing, preserving, and providing access to email, it’s not yet done in a systematic way to become truly effective. It’s not enough to have the shared goal of archiving email; there must also be a deployment of new techniques and approaches, complemented by advanced technology, and improved advocacy. The following is a synopsis and review of the report. In the first section, the “Untapped Potential of Email,” the Task Force observes that, far from being a dying medium, email is still pervasive and powerful, and still contains the important communications which archivists need to capture and maintain to fulfill their critical responsibility of preserving our history. It’s imperative for archivists to understand email in order to become fully knowledgeable about their collections. The nature of email—it’s ephemerality, size, tendency to disorganization, software requirements—means that it is fundamentally different from other electronic records. Among many other points made was that email is already changing traditional archival practices, in that it is drawing more repositories to acquire born-digital accessions. The following section, the “Email Stewardship Lifecycle,” extensively goes through the email lifecycle model, with the associated preservation challenges and suggestions for managing each level. The more technical and substantive material exists in the next three sections, which are about defining email, assessing the landscape of email preservation, and identifying problems and promulgating potential solutions. The section “Email as a Documentary Technology” explains an email’s architectural characteristics (the structure of a message, operational and administrative features, software systems, and why email became so widely adopted), security vulnerabilities and their complications, and additional components (such as attachments and links). The next section, “Current Services and Trends”, is an excellent summary of the state of email communications in today’s society and how the IT industry and the archival/library community are addressing various challenges. Included are problems with email abuse and security (which can have a deleterious effect on ensuring authenticity) and the features industry is introducing to combat them (the report notes which solutions are the most and least valuable to archives). Also considered is the range of existing records management solutions and how useful they are (or not) to long-term email archiving, and the additional work the archival and library community has taken in capturing, authenticating, and preserving messages. This section notes that the archival community has already consolidated around disk imaging and various types of data exports as effective ways to capture emails. Discussion of current preservation tools and strategies are in “Potential Solutions and Sample Workflows.” As the report states, “regardless of the chosen approach, tools should be able to exchange data regarding both the email and relevant preservation actions.” The pros and cons of various preservation strategies, and suggestions for what a community data model should look like, are thoroughly discussed. The report closes with the “Path Forward: Recommendations and Next Steps,” which provides both short-term and long-term proposals in the areas of community development/advocacy and tools support, testing, and development, helpfully targeted to repositories of varying levels of electronic records archiving and tech-savviness. The documenting of process should be central to any email preservation strategy, and is part of an overall need to develop new kinds of archival practices (such as aggregate description). The openness of email that is key to its success and popularity is the primary complication of preserving it in the long-term, in accordance with archival principles. Archivists should be aware that current “email archiving” industry solutions are largely geared to legal or records management issues of compliance, retention, and risk management, i.e. deletion of emails as soon as possible! Since email is bulky and unorganized, automation (such as predictive coding) and even artificial intelligence in some form will play an increasing role in its management. Scattered throughout the report are workflows/scenarios, term and format definitions, technical explanations, and case studies. One of the most valuable parts of the report is the series of appendices on email preservation tools and current email preservation research projects, including an automating system processes model. It’s a great resource for those who want to know about the latest initiatives and standards in email archiving. The report provides one of the most comprehensive assessments of the subject and many readers will find their challenges, concerns, and experiences with archiving email reflected and verified. It certainly succeeds in establishing an “interoperable toolkit” that provides useful information and solid ideas for creating or furthering an email archiving plan or strategy without getting bogged down by policy decision specifics or limitations of tools. The report not only “gets down in the weeds,” but also considers the bigger picture by making connections between current technology and process and available financial and labor resources. The report is not a one-off but part of a larger Task Force program to secure stakeholders, follow up on promising approaches, and augment existing recommendations. The Task Force urges that, at whatever level you perform email preservation and access, you can achieve a workable solution. You can download or purchase the report from the CLIR website (CLIR Pub 175). Officially announced at the session “Email Archiving Comes of Age” #201 on August 16, 2018 at the Society of American Archivist annual conference in Washington, D.C. The Digital Archives Specialist (DAS) is one of two certificate programs available through the Society of American Archivists (SAA). Through both online and in-person courses, the curriculum is “designed to provide you with the information and tools you need to manage the demands of born-digital records.” SAA provides excellent information on their website for those interested in checking out individual courses to meet a specific need and for those who want to pursue the DAS certificate. To earn a DAS certification, you must complete courses in four areas: Foundational (four), Tactical and Strategic (three), Tools and Services (one) and Transformational (one). SAA allows 24 months to complete the coursework, then up to five months after that to pass the comprehensive exam. All tests for individual courses are timed and taken online, with testing out of Foundational courses as an option. The comprehensive exam is taken the same way, but is only available during the months of April, August and December. I’ve worked in the Baylor Libraries in Texas since 1995, first as a staff member in the fine arts library when I began my MLIS, and then as an assistant in library development when I completed my degree in December 2000. I moved to the W. R. Poage Legislative Library in June 2008, but didn’t begin working with archives until five years after arriving. I was strongly encouraged by the interim Dean to take the Certified Archivist (CA) exam and passed in August 2016. I decided to pursue the DAS certificate to increase my understanding of the digital records received by congressional archives and to make better decisions about what to digitize. The nuts and bolts of getting the certificate were not overly taxing. SAA requires that you take at least two courses in person; however, I ended up taking seven on site and four online. Two of the in-person courses were taught here at Baylor and hosted by the Poage Library. Hosting provided a good way for me to take two classes I needed, and also benefited other library staff members on campus. The farthest in-person course I took was in Kentucky. It was my last class and I wanted to take the comprehensive exam in April 2018, so I traveled for the timing to work out. The other courses were closer for me in Houston and Austin. Poage Library paid for most of the courses and I paid for travel. Earning a DAS certificate facilitated my growth in knowledge of digital archives. I took courses in the essentials of electronic records – appraisal, arrangement and description, and preservation and access. I learned how to manage, curate and preserve digital archives. I even took a class on command line interface which was new to me, yet seemed familiar in an HTML kind of way. What the process didn’t do was teach me the technical skills to be my own digital archive shop. A few of the courses provided hands-on experiments with ingesting, arranging, and describing digital records. I did not possess a lot of technical skills other than HTML going in, and the DAS curriculum was not designed to teach them to me since the certificate requires only one “Tools and Services” course. I am very fortunate that at Baylor we have a digitization center with staff who possess the technical skills necessary to work with digital objects. However, they are not archivists trained in archival principles with an understanding of which artifacts possess significant research value, and are thus worthy of sustaining digitally across generations of technology. Digitizing material or retaining digital objects without applying archival principles is obviously expensive and unsustainable. The DAS curriculum has taught me to create the practices, procedures, and plans to complement and enhance the digital archives at my institution and library. The DAS provided professional growth and will assist with my CA recertification. I am glad I made the effort to earn it, and I look forward to taking more courses next year to meet the 5-year recertification. Never stop growing. Never stop learning! Society of American Archivists. Digital Archives Specialist (DAS) Curriculum and Certificate Program. https://www2.archivists.org/prof-education/das Accessed July 28, 2018. A number of courses have been added since I started in October 2016, and will make it easier to complete more classes online. DAS courses can help with learning technical skills with classes such as Advanced Digital Forensics for Archivists, Research Data Curation, Preservation Formats, Tool Selection and Management, and Archival Collections Management Systems. Electronic Records Modular Manual: Two More Modules! The Electronic Records Committee (ERC) of the Congressional Papers Section is pleased to announce a new set of modules for its electronic records manual. The modules, by new entrants John Caldwell (University of Delaware) and Nathan Gerth (University of Nevada), are on workflows involving BitCurator (a suite of digital preservation tools) and a descriptive tool for digital records called Brunnhilde. The BitCurator module sets out the steps needed to create a disk image, and the Brunnhilde module explains how an appraisal report can be generated from a disk image. Because these modules work with different aspects of disk images using BitCurator, they closely complement each other. BitCurator is an important resource in the archival community and we are pleased to have some examples of possible workflows for it. The modules feature diagrams, screenshots, and command line instructions, and cover the areas of accessioning and description. These modules bring our collection to 15! The idea of the modular manual is to provide documentation for a possible method to address a need in an electronic records workflow. An institution can mix and match them to create an electronic records workflow that meets its needs. Community members are invited to contribute their own process documentation. The goal is to build up a collection of modules that offer alternatives to each task that makes up the electronic records workflow, from donor discussions through access. Modules are offered separately or complete in a PDF portfolio. When formulating this initiative, the ERC put together an outline for further modules. Please contact the ERC if you would like to contribute a module and we will provide you with suggestions. 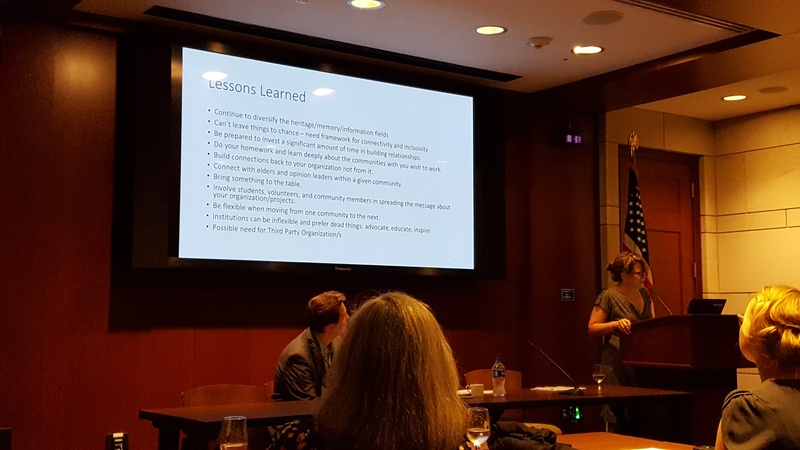 Alison White, of the Senate Historical Office, and other current or former Congressional archivists, participated in a session on issues involving digital preservation of congressional records at the National Digital Stewardship Alliance’s Digital Preservation conference back in October. Instead of doing just a regular blog post about the session, she put together a special “storify” of the archivists’ tweets. Alison’s complete post can be found here. One of the core functions of the U.S. Congress is to represent the views and needs of constituents. Members of Congress serve as constituents’ connection to the federal government, representing constituents, state, and local issues while debating legislation of national importance. Constituent correspondence, or issue mail and casework, has traditionally been maintained as voluminous paper files (and sometimes microfilm), but since the late 1970s, Congress has employed computerized systems. As systems have become proprietary and grown in complexity, the exported data poses real challenges to the archives and libraries seeking to preserve the documentation of this crucial relationship between constituents and their representatives. Without a strategic effort by the archival community to process, preserve, and provide access to constituent data, an entire body of historical documentation of American democracy is in danger of disappearing. With this reality in mind, the Congressional Papers Section formed the CSS/CMS Task Force in August 2016 and charged it with investigating the issue and making recommendations. Over the last year, the Task Force has pulled together the most comprehensive report to date about Constituent Services Systems (CSS) in the Senate and Correspondence Management Systems (CMS) in the House of Representatives. The report provides an overview of how CSS and CMS developed over time, which vendors and systems are currently in use, how systems are deployed in congressional offices, and how data is transferred and exported. It looks at the common obstacles faced by archives and libraries that receive the data and the ways in which archivists have been trying to address these challenges. It also provides a list of academic work that has relied on analog constituent correspondence, while noting the vast potential for research, both inside and outside the academy, with constituent data. Finally, and most importantly, the report provides guidance for short- and long-term management and preservation in collecting repositories. The short-term guidelines provide instructions for conversations with congressional offices about constituent data, as well as basic born-digital best practices to ensure data is stored safely. In the long-term, the report recommends a vested advocacy coalition to support management guidelines in member offices, in commercial vendors working with congressional offices, and in collecting repositories, and it calls on the community to develop a technological solution for processing, preserving, and providing access to constituent data that will benefit both large and small repositories. The Report is available here under “Other Resources-Political Papers” and on the CPS site.